Below is a viewpoint from Chapter 6 of the Foresight Africa 2019 report, which explores six overarching themes on the triumphs of the past years as well as strategies to tackle the remaining obstacles for Africa. Read the full chapter on boosting trade and investment. The 2018 Beijing Forum on China-Africa Cooperation (FOCAC) Summit was the signature event that determined China’s priorities toward Africa for the next three years. Deviating from its tradition of doubling or tripling its financial pledges, China’s commitment remained the same as in 2015, $60 billion. Judging from its volume and composition, China’s commitment remains strong, but appears to be more cautious and calculating than its past pledges. The concessionality of the Chinese financing is being moderated, while China has grown visibly more focused on the commercial and viability aspects. From the traditional model of “resources for infrastructure,” China appears to be morphing toward the next stage: equity investment by a more diverse group of investors supported by state development finance. Meanwhile, Africa still has major catching up to do to gain more Chinese investment and to diversify its trade relations with China. The Chinese narrative about its development efforts toward Africa is undergoing significant changes. Indeed, China has demonstrated an increasing interest in identifying its financial contribution as development finance, rather than development assistance. First, this is because China has failed to meet the prevailing criteria for official development assistance. Second, the reduced emphasis on the aid aspects also helps to square the circle between the self-serving, commercial aspects of the Chinese financing and the presumably altruistic intention of China as a responsible stakeholder. What China offers Africa is not a blank check and a guaranteed result. Indeed, what China offers Africa is not a blank check and a guaranteed result. Instead, Beijing offers Africa the opportunity to speed up its economic development based on the infrastructure China develops, to utilize the technologies, employment, and market opportunities China creates, and to stimulate the desire and competition for growth through market-based rather than assistance-based approach. The Chinese financing is neither free nor altruistic. But that is not the point. The real point is: How can Africa better utilize the opportunities China creates and avoid the traps it brings? The answer to that question has not been China’s priority, but instead it has focused on better decisionmaking, more disciplined domestic policy, and, most importantly, better governance. As China expands its Belt and Road Initiative in Africa, government-level U.S.-China cooperation in Africa continues to be scarce. 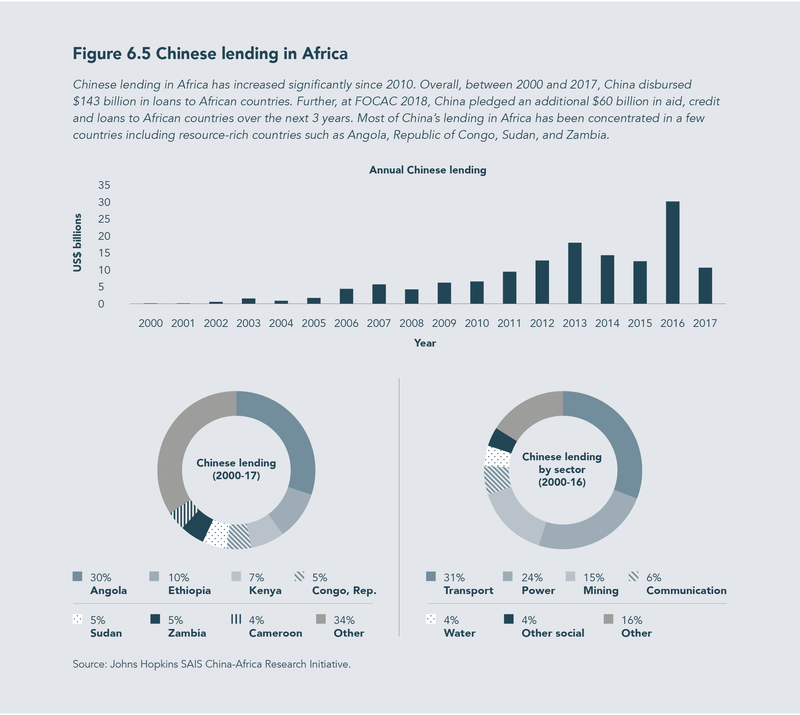 However, this trend contrasts sharply with the growing collaboration between Chinese and American companies in infrastructure projects on the continent. Indeed, although the Chinese projects and financing have the tradition of favoring Chinese contractors and providers, the technical advantages of some American companies have made them the beneficiary of the Chinese campaign.